Pictures on this site are copyright George Flickinger. I have taken all pics unless otherwise noted, please email me for picture usage info. Most of my work is on Tulsa TV, but I've made occasional appearances on national TV during weather disasters. I started this site years ago as nothing more than on-line storage of my family, weather and storm chasing photos. 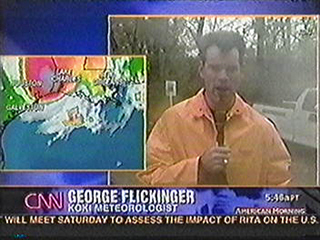 Now, I use "flickingerweather" to keep track of weather events I've covered long after the storms are gone. I have a cool and unusual job-- my work has allowed me to stand outdoors during hurricanes, watch large tornadoes toss wheat in my face, and I've been bruised by huge hailstones. This site shares these and other experiences with you as I get to see what many don't. As of 2010 I'm employed with KJRH Channel 2, the NBC affiliate in Tulsa where I'm a TV Meteorologist. I love my job as I'm usually the first one out the door when severe weather approaches-- this is my dream job. I've worked in Tulsa since 2002. 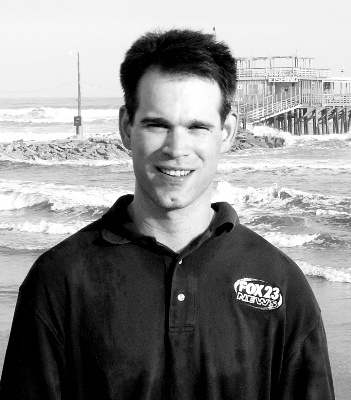 Some folks still remember me from "Fox 23" in Tulsa, and before that I was the Chief Meteorologist for 5 years at KTXS-TV in Abilene, Texas. I consider the massive May 3, 1999 tornado outbreak in Oklahoma as the turning point in my career. 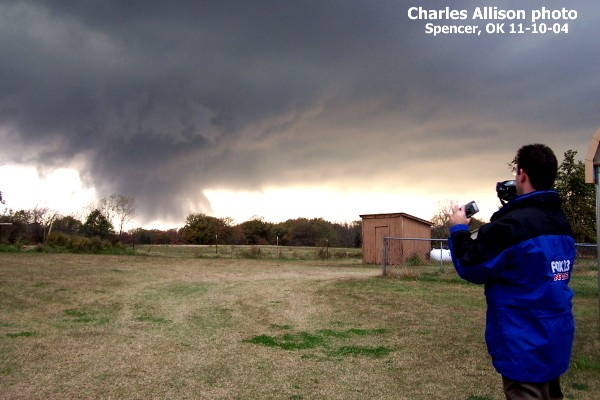 After watching meteorologists like Dan Threlkeld ( who at the time was at KFOR-TV in Oklahoma City), I wanted to experience a more active weather market and to study tornadoes...at close range-- I gave up my cushy Chief job so I could spend less time on camera and chase storms more often and learn from my experience. I guess I got my wish as since making Oklahoma my home I've seen more than tornadoes than I care to count. My images have appeared on nearly every major TV network. Don't ask-- I don't sell my pics as I don't want to profit from what could be someone else's misery. Instead I've donated my pictures and video to fundraisers for storm victims. You might have heard of my hometown of Orange, Texas. It's a smallish coastal town that's been battered in recent years by Hurricane Rita and Hurricane Ike. I graduated from West Orange-Stark High School. I'm a member of the Fightin' Texas Aggie Class of 1995, and we own Texas A&M season football tickets. Speaking of sports, I've played casually to competitively forever. Send me a message if you need someone to fill in for your baseball, softball or basketball teams. (I'm a decent middle infielder with slightly better than warning-track power, and I make ugly shots playing basketball) I'm also a member of the Tulsa Bicycle Club, and I pedal over 2,000 miles a year. Professionally I've won a handful of awards for broadcasting in Texas and Oklahoma. Some of the awards I've won, like the First Place award for "Best Weathercast in Oklahoma" sound impressive as I won the award the only year I applied for it. But awards don't mean much in TV as just about anyone can win them sometime. My wife and I also assist Oklahoma Westie Rescue and Tulsa Air Conditioning Coalition.